Although they worked together on film in various combinations, Boris Karloff, Bela Lugosi, Vincent Price, and Peter Lorre never teamed up as a foursome. Until now. Every Sunday night in October, getTV celebrates one of these horror icons with an hour-long retrospective packed with rare footage, interviews, and career-spanning film clips. Following each documentary, the star is featured in a spooky classic guaranteed to get you in the spirit of the season. Plus, there are other dark delights throughout the month for your booing pleasure (sorry). So bar the door, wolfsbane the windows, and sink your teeth into the Halloween Horrors this month on getTV starting at 10 pm Sunday nights! Audiences today probably know Peter Lorre best as the thief who begs Bogart to “Hide me!” in Casablanca. (Try reading that without doing an exaggerated imitation. It’s impossible.) But the Hungarian actor was better known throughout his career for horror films and horrifying characters. From Fritz Lang’s M in 1931 to the Roger Corman Poe films in the early 1960s, Lorre’s creepy countenance graced many a frightening film, both serious and darkly comedic. Peter Lorre frequently played sympathetic bad guys, and that perverse charm is on display in this noir/horror hybrid from Robert Florey (who also directed Lorre in The Beast with Five Fingers). In a story that echoes his own escape from Nazi Germany, Lorre’s Janos Szazbo flees Hungary for a better life in America, only to be severely disfigured in a fire. Janos turns to a life of crime and uses the spoils to buy a new face, an eerie mask created in his former likeness. Now a successful gangster known as Johnny – all gangsters in old movies are known as Johnny, even if they come from Hungary – Lorre is rehabilitated by a blind woman (Evelyn Keyes) who sees him for what he is, not what he looks like. But his second chance doesn’t go as planned. “What the Beatles were to music, Karloff was to monsters,” narrator Richard Kiley says in this special. From his definitive portrayal of Frankenstein’s Monster – which should never be called simply “Frankenstein,” thank you very much – to his Grammy-winning vocal turn in Dr. Seuss’ How the Grinch Stole Christmas, Karloff earned every ounce of the name recognition he still commands nearly half a century after his death. He conquered the stage (both early in his career and again in the 1940s with Arsenic and Old Lace), screen, and television (as host of NBC’s Thriller and in numerous guest appearances) and continued to work until his death, despite debilitating ailments. 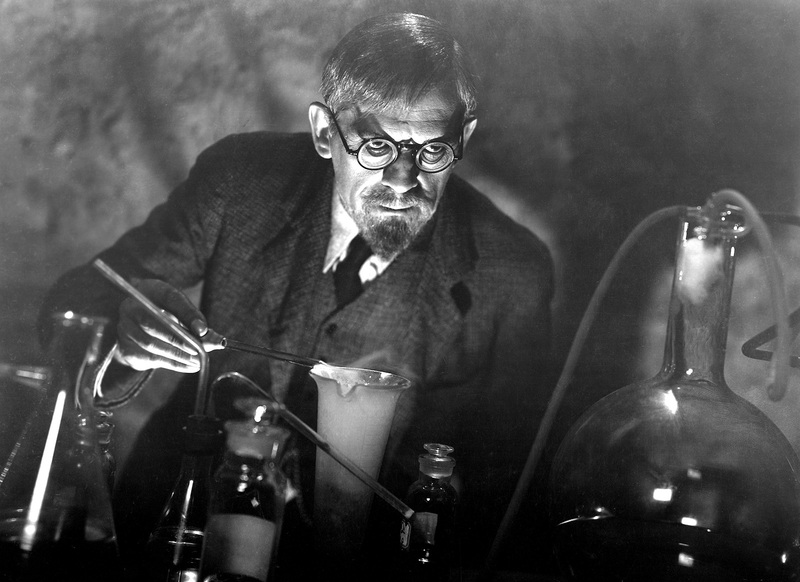 Karloff is best known for his monsters, but he actually played mad scientists more often. He’s at it again here, as a doctor experimenting with human cryonics, freezing the sick to arrest the spread of disease. When we first meet Dr. Leon Kravaal (Karloff) he’s been in cold storage for more than a decade. When he’s revived – with perfectly groomed facial hair – Kravaal reveals that he has other guests accumulating in his refrigerated section, against their will. A tense battle of wills follows, as Kravaal tries to prove the merit of his experiments before one of his defrosted captives ices him for good. Although Lugosi’s Dracula is one of the most enduring movie monsters, he only officially played the character twice on film: in the 1931 original and the 1948 comedy Abbott and Costello Meet Frankenstein. While Universal may have dropped the ball with Bela, Columbia did not, making the closest thing we have to a Dracula sequel with Dracula actually in it. Return of the Vampire shows the now 61-year-old still at the top of his game as a vampire roused from staked slumber by the German Blitzkrieg. Nina Foch is the object of his affection and Matt Willis is his werewolf assistant. Be honest, wouldn’t you love to have a werewolf assistant? Of all the classic horror stars, Vincent Price may be the most accessible to contemporary audiences, thanks to his unfettered malevolence in films made as censorship guidelines disintegrated. He also achieved a longevity unmatched by other legends, working steadily into the 1990s. Plus, he was the voice of Michael Jackson's Thriller video and an entire season of Scooby-Doo cartoons. House of Wax in 3-D was a huge hit for Warner Bros. in 1953, so Columbia quickly followed up with this homage a year later, also featuring Mr. Price (as titular illusionist Gallico the Great) and also in 3-D. In many ways, the black-and-white Magician is more fun, leaner and meaner than the color House of Wax with some truly sadistic set pieces by German director John Brahm (The Lodger, Hangover Square). Sadly, it will not be broadcast in 3-D, but maybe you can ask your spouse to throw things at you. John Carradine plays a top-hatted Dracula in the Old West battling the world’s most famous gun-fighter (Chuck Courtney). Like in Batman vs. Superman, the titular “battle” takes up maybe five percent of the film’s running time. The final feature film for prolific director William “One-Shot” Beaudine (who began his career in 1911) is not quite as much fun as the title suggests, but still worth a look, if only for “Mrs. Olson” from the Folgers coffee commercials of the 1960s and ‘70s. Dr. Frankenstein’s grand-daughter (Narda Onyx) takes over a monastery in the Old West and the locals start mysteriously disappearing. Notorious gunfighter Jessie James (John Lupton) ends up in her lab with his hulking sidekick (Cal Bolder) and the monster-making commences. Look for Jim Davis (Jock Ewing on Dallas) as the marshal and Nestor Paiva (the boat captain in Creature From the Black Lagoon) as the saloonkeeper. Note: Jesse James Meets Frankenstein’s Daughter and Billy the Kid Versus Dracula were produced (in eight days!) to play as a double feature in 1966. In celebration of their 50th anniversary, getTV is airing them back-to-back late Saturday night of Halloween weekend. Enjoy!